Run along the SS1 Aurelia road , exit Grosseto Sud and turn to the right, in the direction of Scansano. 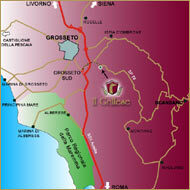 Follow the road for 2.6 Km, turn to the right on the Provincial Road 79 in the direction of Poggio alla Mozza. Go on for 900 metres, and on the right you find the Farm of "Il Grillese" .